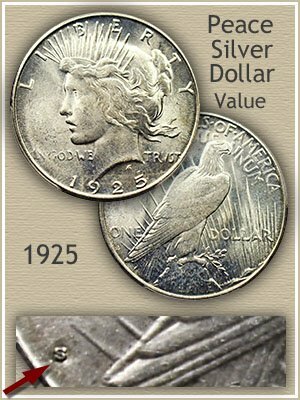 Supply and demand have a large impact on your 1925 Peace silver dollar value. Currently your coin is worth a minimum of $17.87 because of its large silver content. Today's base value is driven by strong demand from silver investors seeking a position in the precious metal. Fitting nicely with the bullion market. 1925 Peace dollars are available in quantities, a widely recognized classic US coin and heavy with silver. Additional demand for Peace dollars is also strong among collectors. 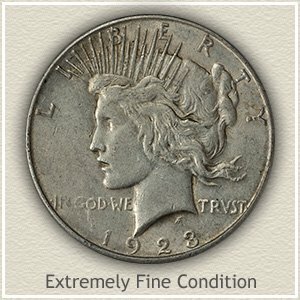 Top condition examples and the "S" mint marked 1925 silver dollars are what they seek. However these are not found in quantities and supply now becomes an issue. Determining your coin is within this sought after collectible group finds its highest value. 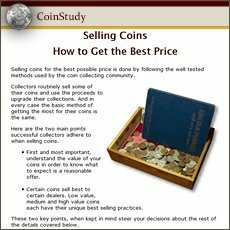 Although $17.87 per coin is certainly a nice start, to find an accurate value a study into mintmarks and condition is necessary. Using the images and descriptions further down the page helps find mintmarks and determine condition. Of the two mints that struck 1925 Peace dollars it is the San Francisco issue with the lowest supply surviving today. San Francisco production is identified by the "S" mintmark on the reverse, look along the rim above the eagle's tail feathers. The main mint in Philadelphia also produced silver dollars in 1925 however it did not use a mintmark. High demand and a low supply is represented by the 1925-S Peace dollar pictured. Popular as a series, many collectors strive to assemble complete date and mintmark collections, with an eye towards quality. Finding a suitable San Francisco 1925 silver dollar meeting high standards is a challenge to completing a collection. Quality of preservation sets this coin apart from those trading at silver bullion value. It represents the condition eagerly sought by collectors, unfortunately few survive today as nice. These limited numbers of surviving coins is met by a large collector base supporting a high 1925 Peace silver dollar value. Remaining in uncirculated condition with unbroken, bright luster, both sides of this coin are notable by the lack of abrasions to their surfaces. Considered a "choice" example, bidders at a David Lawrence rare coin auction competed to a final price of $195.50. A valuable 1925 silver dollar combining excellent condition, low supply, and solid demand, a true collector coin. 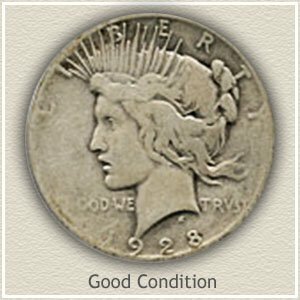 Condition is often the deciding factor to 1925 Peace silver dollar value. Coins trading as bullion are worn and lacking detail, well preserved examples trading at the high end of value are in demand by the collector. Comparing your coin to the images and descriptions help recognize the higher value collectible coin. Uncirculated: Peace silver dollars in "uncirculated" condition must not show any wear to its surface. First to show wear is the delicate mint luster imparted to the surface when first coined. Determine if this luster is still complete by holding your coin at a slight angle to a source of light. When tilted back and forth an uncirculated silver dollar displays unbroken luster rotating across the entire design. Even a short time spent in circulation quickly removes this luster leaving areas dull in appearance. 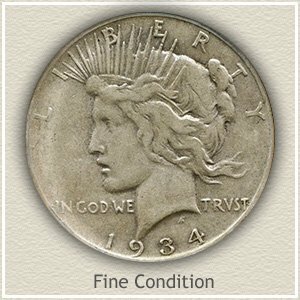 Extremely Fine: Once a slight amount of detail is missing, the result of wear, the grade of "extremely fine" defines your coin's condition. Note: Wear should not be wide spread, instead limited only to small portions of Liberty's cheek and back of hair. Overall a pleasing coin, displaying a vibrant appearance when viewed at a distance. In this higher grade 1925-S Peace silver dollar value now enters the collectible side of the supply/demand equation. A careful examination is necessary. Fine: Wear has smoothed and reduced metal over all parts of design. If not to severe your coin is in "fine" condition. Detail within the hair is still visible, major strands are still separated, although the finer strands have merged. Liberty's cheek and neck now displays a few areas of flatness. On the reverse the eagle's lower tail feathers closest to the mountain still show separation. Good: Lack of detail over large areas, defines the "good" grade. Once well-defined strands of hair are now missing, once rounded features of Liberty's cheek are flattened, leaving an overall smooth and worn appearance. 1925 Peace silver dollar value in this condition is supported by the bullion metals market. Old coins retain a strong collector following. Plus, if your dimes through dollars are dated prior to 1965 they contain 90% silver. Additionally within each series are rare date and mintmark combinations. Revisit your box of old coins, today's value charts show a steady increase. 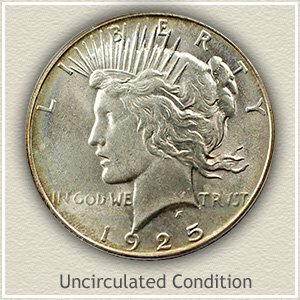 With today's collector and bullion investors both admiring these large silver coins, Peace Dollar values are very strong. All have a minimum value of $17.87 with many rare date and mintmark combinations far exceeding the base silver value. Determine how much your old Peace dollars are worth. 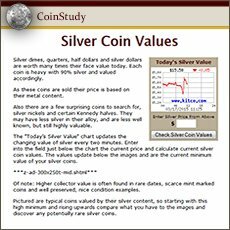 Check all your silver dollar values with the coin value chart. Early dollars are scarce and highly valued. Morgan silver dollars are a minimum of $17.98 and Peace dollars are now worth $17.87 each. Demand from rare coin dealers, high collector interest and silver bullion value are all positives for your coins.